For the ANZAC 'long weekend' a group of us teachers decided to go on a camping trip to Rollinstone Beach Caravan Park with our families. As it wasn't traditionally a long weekend, we all had to return for work Friday. So being not much more than 30mins out of town, Rollingstone Beach Caravan Park was an ideal location for a quick trip away. We left directly from work Wednesday afternoon with boat in tow. By 6.30pm we had the camp set up and dinner ready. I have never been into this camp ground before, and we were pleasantly surprised when we drove in. The grounds are pristine, and out camp site was right on the beach. We opted for an on-suite site which we wouldn't normally do. But it was an excellent choice, giving us a personal toilet and shower as well as a room for lockable dry storage! There is also a beautiful pool and well maintained camp kitchen facilities. Thursday, ANZAC day, was my birthday, so there was no option for the family other than fishing! I spoke to Graham Knight from G & T Fishing School and Charters on Wednesday night and he talked of monster Queenfish off the Jetty! 'Sounds good' I though! We left early and headed for Lucinda. A quick breakfast stop and McDonalds in Ingham and we were at the ramp right on sunrise. A comfortable run to the end of the Jetty and Humminbird 998 soon light up with fish marking high in the water column. Down goes the Minn Kota and the magic 'spotlock' button held us over the best of the school. We put down a selection of GIMP lures and Bumpa-Bars, but it was the GIMPS the fish wanted! I was the first to hookup. A big queenfish smashed the GIMP mid water and was soon peeling 20lb PowerPro for the Sustain 4000. But too much pressure from myself as the fish headed to the structure resulted in the leader parting from the braid. But it was that or the jetty, as I found out from the next fish! I gave him the chance to run, and he found the structure! Lachlan was next, working a GIMP at mid water while I re-rigged the other line. Again the fish raced off and around the corner of the nearest pilon. I tried to manoeuvre the boat between the fish and structure, but it was unsuccessful. Finally, after a quick succession of lost fish and lost lures, I finally managed to boat one! 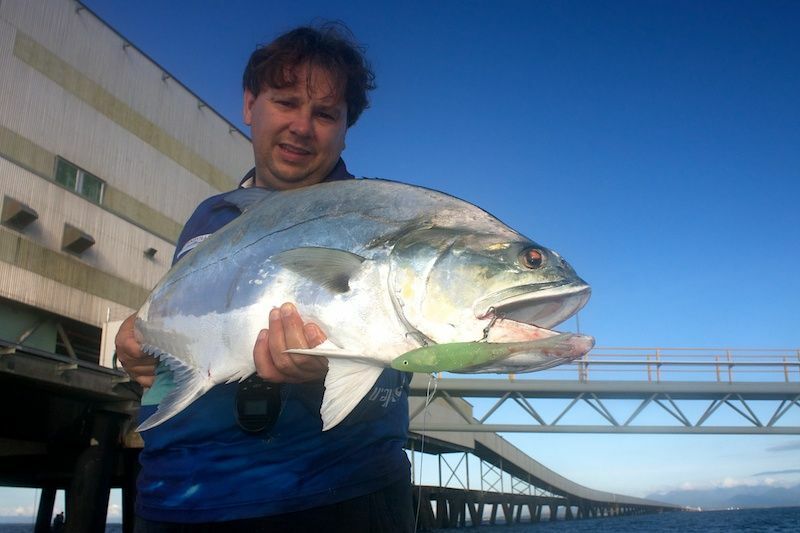 This fish ran to open water and jumped well clear of the Jetty. A few good jumps and the fish was stuffed. It was easily lead the boat and the waiting net. Hold on, 'I think the net is still in the back of the car'!!!! Luckily it was an easy tail grab and fish was lifted aboard. This one went in the eski too cook on the BBQ that night for the hungry hords! As the tide slowed and topped out the fish went off the bite. I have no doubt they would have returned once tide started running out, but I had a date with a Barra up the channel! But unfortunately I was stood up! Due to other commitments for the day we had to pull out about lunchtime. A very thorough chat with fisheries at the Dungeness ramp and we headed back to camp. The wind camp up Friday afternoon and put a stop to any further fishing. And I think it has pretty much blown ever since!